The Google+ social networking site has joined the long list of websites filtered by the Islamic Republic. ITNA, Iran’s Telecommunications News Agency, reports that Google Plus which was announced two weeks ago, will no longer be accessible to Iranian users. Google Plus is still not officially available to all users but it would have been over the next few months; however, Iranian authorities have already blocked the site without any explanation. Iranian authorities have expanded their efforts to block internet sites since the controversial presidential election of 2009, which triggered widespread protests. Protesters used social networking sites to rally demonstrators and also to report on the protests using text and photos. and the prison authorities have failed to transfer him to the prison clinic or a hospital. according to the Human Right House of Iran, in a letter to leaders of the Green Movement, he has requested that they continue to fight for freedom and justice. he has been sentenced to 5 years in prison and was arrested after the disputed presidential elections. BEIJING Aug 5 (Reuters) - China pushed back at U.S. pressure on its business and oil trade with Iran in comments published on Wednesday, while Iran's oil minister was in Beijing seeking to shore up ties with the big customer. Chinese Foreign Ministry spokeswoman Jiang Yu was responding to comments by Robert Einhorn, special adviser for nonproliferation and arms control at the U.S. State Department, who said on Monday China should observe sanctions against Iran aimed at forcing it to curtail its nuclear ambitions. Western governments have pressed China to loosen its energy and economic ties with Iran, which they see as shielding Iran from international pressure. 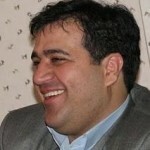 Iran's oil minister, Massoud Mirkazemi, is in Beijing for talks with Chinese energy executives. He has not made any public comments. Jiang, the Chinese spokeswoman, said her country's trade dealings with Iran should not be criticised. "China's trade with Iran is a normal business exchange, which will not harm the interests of other countries and the international community," she said in comments published in the official China Daily. "As a permanent member of the U.N. Security Council, China has always observed the council's resolutions," she said. Iran is a major supplier of crude oil to China, the world's second-biggest consumer of oil after the United States. The United States has urged China to tap other suppliers, but China has condemned unilateral U.S. and E.U. sanctions aimed at Iran's energy sector. China has backed U.N. Security Council resolutions pressing Iran to abandon disputed nuclear activities, which Western governments say are aimed at giving Iran the means to make nuclear weapons. Iran disputes that. The latest resolution was passed in June. But China has also wielded its veto power over Council resolutions to protect energy and trade flows with Iran. President Obama put the issue of negotiating with Iran firmly back on the table Wednesday in an unusual White House session with journalists. His message was that even as U.N. sanctions squeeze Tehran, he is leaving open a "pathway" for a peaceful settlement of the nuclear issue. "It is very important to put before the Iranians a clear set of steps that we would consider sufficient to show that they are not pursuing nuclear weapons," Obama said, adding: "They should know what they can say 'yes' to." As in the past, he left open the possibility that the United States would accept a deal that allows Iran to maintain its civilian nuclear program, so long as Iran provides "confidence-building measures" to verify that it is not building a bomb. The renewed opening to Iran also included a proposal for talks on Afghanistan. Obama said he favored a "separate track" for discussion of this issue, in which the two sides have a "mutual interest" in fighting the Taliban. He urged that, as part of Afghan President Hamid Karzai's push for "reintegration" with the Taliban, Iran should be included in regional talks about stability. "Iran should be a part of that and could be a constructive partner," he said. Why is Obama talking engagement with Iran when many analysts are debating the growing risks of a military confrontation? Administration officials cite two factors: First, the sanctions against Iran are beginning to bite, making Tehran potentially more interested in dialogue; and second, U.S. intelligence reports indicate that the Iranians have had technical troubles in their nuclear-enrichment program -- which allows more time for diplomacy. The White House chose an unusual way to send its signals to Tehran. A small group of journalists was invited to a "background session" on Iran policy with "senior National Security Staff." The briefer turned out to be Obama. An official said later that the president plans more of these unscripted, informal meetings. Obama has tried to engage Iran before but has little to show for it. Last year, he sent two secret letters urging dialogue to Iran's supreme leader, Ayatollah Ali Khamenei. This helped get the Iranians to the table in Geneva to discuss a plan for enriching uranium outside their borders. 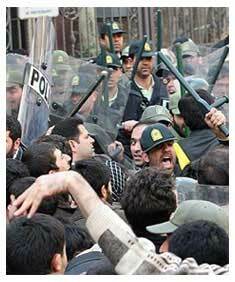 But Khamenei backed out, even though Iran's hard-line president, Mahmoud Ahmadinejad, initially supported the deal. Obama said he hadn't had any direct contact with Khamenei or Ahmadinejad about renewing talks, but he said Iranian officials have said they want to rejoin the Geneva negotiations with the group of leading nations known as the "P5-plus-one," perhaps in September. Obama's sense that the time is right for diplomacy is shaped in part by what he called "rumblings" from Tehran that the sanctions are having a greater effect than the Iranians expected. Officials said these signs include the strike last month by Tehran bazaar merchants who are unhappy about the battered economy, as well as recent signals through various channels that the Iranians want to come back to negotiations. A senior official who briefed the journalists after Obama left the room said sanctions are more effective now because there are "better tools" to target the Iranians, "more cooperation" from U.S. allies -- and because the Iranians are "more vulnerable." Another senior official stressed that "sanctions are not an end in themselves," but a way of influencing Iran's cost-benefit analysis. What came through in Obama's upbeat presentation was the administration's view that for all Tehran's bombast, the United States and its allies have the upper hand. One reason for this confidence is that Iran appears to be having serious technical problems with its enrichment process -- due to bad design, bad luck or deliberate sabotage. A senior official said that only 3,800 centrifuges were now operating at Natanz, at only about 60 percent of their design capacity, with another 4,000 in reserve to cope with breakdowns. U.S. officials also appear increasingly confident that because of Iran's setbacks and aggressive monitoring by U.S. intelligence, it will be hard for Tehran over the next year or two to achieve either a "breakout," where it announces it has a bomb, or a "sneak out," where it reaches that goal surreptitiously. Obama's strengths were on display Wednesday in his strategic analysis and his command of detail. Skeptics in Israel and elsewhere would question whether Iran subjects its nuclear policy to a cost-benefit analysis. But Obama, uncertain about that issue himself, is at least proposing to put it to the test. BOSTON Aug 4 (Reuters) - The $41.3 billion Massachusetts pension fund will have to sell investments in any company involved in Iran's oil industry under new rules adopted on Wednesday. Gov. Deval Patrick signed legislation requiring the state's Pension Reserves Investment Management Board to identify all such companies within one year. The board would then have one more year to divest shares of the companies. A preliminary review found the fund may have to sell up to $294 million of securities under the new ban, spokesman Dave Kibbe said. But he emphasized that the estimate was "very, very" preliminary and a more complete assessment was required under the law. The pension fund is already prohibited from making investments in tobacco-related companies and those doing business with Sudan.